This week’s theme is about what we are thankful for in our genealogy research. Since genealogy is all about people, I want to express my gratitude to the innumerable people who have made this such a rich and rewarding avocation. First, I’m thankful for all my ancestors, beginning with my parents and going back through uncountable generations, without whom I simply would not exist! Whether I know them personally or not, they have all contributed to making me the person I am. I’m grateful for all my extended family, for their loving kindness, for sharing their lives with me, for all they do for future generations of our family. My research has provided me the opportunity to meet cousins near and far, whom I never would have thought to contact before I started on this genealogy journey. They have shared family history with me, opened their homes to me, and they continue to bless me in many ways. My maternal grandparents, Laurence Smith and Clare Davis, Montana 1935. Many of my research subjects are not relatives, but their descendants have also been generous in sharing their family treasures: handwritten letters and memoirs, photographs, family trees, and oral history. Some have provided valuable resource tips. They’ve offered me places to stay and more. Many, many thanks to you all. So much research is only possible because of the people who create and maintain archives all over the country and all over the world. This includes all the small, local historical societies, museums, courthouses, libraries, and genealogical societies. Librarians, historians, and archivists have my eternal gratitude for all they do to preserve our heritage. They are amazing! I’m thankful for all the people who have worked to digitize, transcribe, and index records and books so they can be accessed on the internet from the comfort of my own home. It truly is a heady time to be a researcher. My paternal grandparents, Reatha Gusso and Everett Halse, with their four sons, Corvallis, Oregon, 1945. I want to offer a special word of gratitude to an author/historian who recently took the time to review and comment on two chapters of my Elias D. Pierce biography before they went to the (possible) publisher. DNA testing has opened a whole new avenue of exploration. These tests have introduced me to even more cousins, whom I’ve met both in person and online. They even added new branches to my family tree! 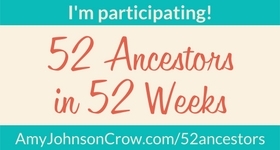 Last, but certainly not least, I am grateful for all of you who read (and listen to) these stories that I share – on my blog, in my family newsletter, on Ancestry.com, in my obsessive dinner-table conversations, and through other media. Gathering knowledge about family history is fun for me, but being able to share it makes it truly worthwhile. Feature image: Me and my two brothers about 1966. Thanks, Heather. I know you already had your Thanksgiving, but have a wonderful Thursday! What a lovely Thanksgiving post! 🙂 Hope you have a wonderful holiday! Thanks, MB. Have a lovely holiday! Lovely post, and good luck on the possible publisher! Thanks so much! Fingers crossed.